Selling cars and closing the deal uses the car sales process as an example of how to close a sale by applying selling techniques throughout the sales process. Take hold of all the sales training available on this website and see it in action throughout the pages of this car selling guide. From prospecting to closing the deal, grab what you find here and apply it to your marketplace. This page on sales closing techniques is part of the automobile sales training section. Here you can gain sales training on how to start closing a sale from the first contact with your potential customer. Then we flow through the car sales process and build the right closing techniques into each stage of your sale. This technique works in any market place, selling cars, retail sales, telesales, direct sales, and field sales. Scan it, think about it, adapt it, and use it. What do you think of this sales pitch? This is really good sales training, isn’t it? I am sure you agree Ms / Mr ....that it meets your needs, yes?. If you’re happy with what you have seen, and I can see that you are, we can get the paperwork completed. This is an opportunity that you won’t want to miss, and the price may go up, or the item may not be here tomorrow, how will you feel then? You can see how this would be of benefit to you? 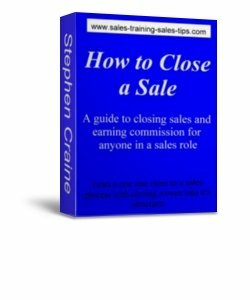 So all you have to do Now is click the link and go to How to Close a Sale and buy the sales training ebook that cost only £9.99 and will multiply your earnings and make you rich. How did that sound to you? It’s difficult to get the tone right when writing compared to presenting a live training session. 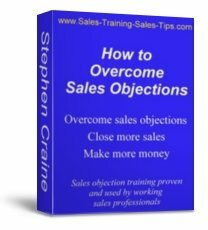 Consider how would you feel if I tried to close you, on buying the sales training workbook How to Close a Sale, with the above sales lines. Those lines do not sound natural coming from me. They sound pretentious and as if I have taken the straight from a sales text book or training course. When you have followed how to close a sale by closing throughout the sales process you don’t need heavy closing techniques or trick closes. ...The days when car salesmen accidentally dropped their pens on the floor for the customer to pick it up, and then find a contract laid out in front of them, and the pen already in their hand, are long gone.. When you have used professional closing techniques, throughout an effective sales process, all you require is a simple direct closing question. Take a look at the sales process below so you get an idea of how the complete car sales process works. A complete car sales guide on selling cars using professional car sales techniques. Car Sales Techniques to Overcome Objections. In traditional sales training on closing the deal, you go through the sales process and attempt a trial close after presenting the sales proposal. When I train my sales teams I show how to close a sale by gaining the strongest agreement during the introduction stage of the sale. With good relationship building skill and your ability to build rapport, this selling technique works well when selling cars. If you haven’t already browsed through the Introduction section on how to sell cars take a quick look by clicking the link to open a new window and then come back here and continue with selling cars. Along with the other key points you should have in your introduction you should build into it a way of gaining agreement to the sales process. In your own words ask the buyer that, If you show them the car, and the deal, that meets what they are looking for, are they in a position to do business with you? You can add a time frame, such as, are they in a position to do business today? You can ask them what their buying process is and see how it compares to the sales process you want them to agree to. They could answer by saying they are going to look at other dealers, or just browsing. By asking this question you know where you are starting from. You can then make the decision on whether to continue, and how much of your time to invest with this buyer. During the questioning stage of selling cars you work towards closing the deal by gaining agreement to the wants needs and desires of the buyer. With good use of paraphrasing, and emphasis of main points, you build a picture for the buyer to match against the sales proposal you present later. To see more on Questioning and how it relates to selling cars, open car selling techniques and see effective sales questioning. At appropriate points confirm the buyer’s agreement to what they want. Drop into the conversation lines such as: So you’re looking for a family size car that gives you low fuel cost but lots of room. This one line may be in response to a whole bundle of information they have given you. This is a really good closing technique for selling cars. Take the information the buyer gives you and condense it into one specific sentence, then work towards closing by gaining their agreement. The biggest mistake sales people make at this stage is not summarizing the buyer’s needs. Put all your specific need statements together and confirm this is what they want. When they confirm it to you, they confirm it to themselves. You show them the car that not only gives them all their needs, such as transport and running cost, but also gives them their desires. You present the car and take them on a test drive, and you continue closing the deal. If you feel you could add more to your presentation skills see sales presentation tips that use emotional selling techniques. Selling cars during the presentation and the test drive you pile on the benfits, but only those benefits associated to the needs, wants, and desires, you discovered in the questioning stage. Link all the customer’s wants, needs, and desires, to features of the car. Then show them how the benefits of those features give them everything they have agreed they wanted in the questioning stage. The next step of the selling cars process is to close the sale on each benefit by gaining their agreement. The best sales training technique to make you an expert and show you how to close the sale using needs, features, and benefits is the Need to Close Chain sales training. Click the link and get a free ebook that will change the way you close the deal, and earn you more commission. When you have presented your sales proposal remember to summarize the main points, and then gain agreement that those main points meet the buyer’s needs, wants, and desires. If I was closing the sale on the sales training on this site I would simply ask you, Does this product give you everything you want? You came to this site to see if you could gain something, is this what you have been looking for? Would you invest £9.99 to have all these closing techiques and more on how to close a sale? A complete ebook that quickly shows you sales closing techniques that will increase your sales and earn you more commission? Simple direct questions that follow on from the sales presentation and smoothly flow into a closing question. No need for a hard sell because you gained the major agreement in the introduction stage. You learned the starting position of your customer, and got out of the way any buyer related objections that you couldn’t overcome. Selling cars and closing the deal is a sales skill that you use right from the start of your contact with a potential buyer. It comes into every stage of the sales process. Build it into all the stages of your sales meetings, take a look at sales training that will show you how to do just that. Practice linking needs to features to benefits and then closing. Claim your free ebook on Need to Close Chains and learn how to get into selling state instantly. 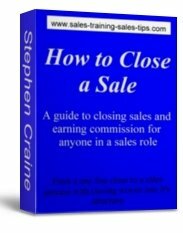 To focus on closing the sale and how to add it to your current sales skills consider How to Close a Sale and then decide if it’s the right investment for you at only £9.99.